Visit all the major tourist sights of Slovenia in one day. Explore the enchanting Lake Bled, with its island church and castle perched upon a cliff, all against a backdrop of Alpine mountains; enter the mysterious Predjama Castle and discover its legends, and visit the breath-taking Postojna caves, Slovenia’s number 1 attraction. We start this magnificent trip by visiting the world-famous Postojna caves, the largest caves of the classical Karst and the most popular in Europe; the cave system totals 20 km (14 mi) in length. Part of the visit is done by train, and part of it on foot. You will be amazed by stalagmites and stalactites forming fantastic shapes and sometimes joining in columns, and you will be awed by the caves’ passages and chambers. We will visit the famous Predjama Castle, medieval home of the robber-baron Erasmus, and arguably the most spectacular castle in Slovenia. Some might argue that this title should belong to Bled castle, but you will soon be the best judge of that! 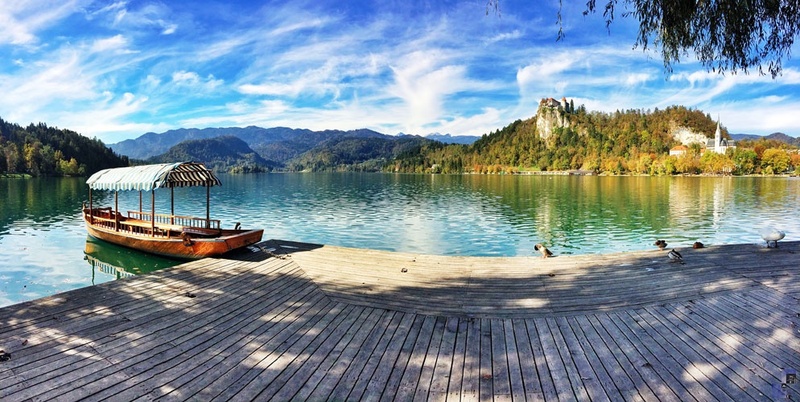 Our last stop of the day is Lake Bled, the world-famous glacial lake renowned for a medieval castle perched on a cliff above the lake. We will visit the interesting museum in Bled Castle and enjoy the bird’s eye view of the lake and its island with the Church of the Assumption. We have time for a short stroll along the lake or a coffee and “kremšnita” (vanilla cream cake, one of the most famous desserts in Slovenia). The Postojna caves visit lasts an hour and a half, and the temperature in the caves is up to 12 º C, so it is recommended to take warm and comfortable clothes and shoes. Surcharges: Entrance to Postojna Cave and Predjama Castle (31 € / person), entrance to the castle with a wine cellar, an old print shop, museum and a chapel (11 € / person), pletna boat ride to the island in the middle of the lake (14 € / person), visit of the church with the “wishing bell” (6 € / person).